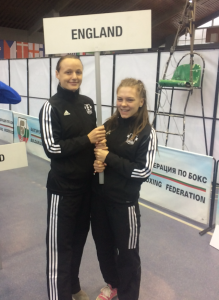 We are delighted to have an article on the EUBC European Women’s Boxing Championship, recently held in Sofia, Bulgaria, written by Raven Chapman. Raven is a member of the Arena Boxing Club in Bournemouth and wrote herself into the boxing history books as one of the first women to contest the English title series belt in January of this year. She then went on to become the first Dorset boxer, of either gender, to win the National Championship. On the 14th of November I found myself standing in Bulgaria in the middle of a wood, outside a small sports hall. 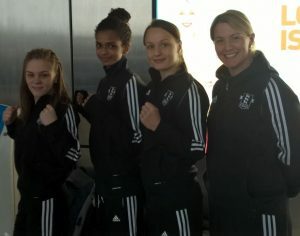 You wouldn’t even think there would be much happening here, let alone the biggest tournament for female boxers in Europe. But as unimpressive as it might have looked, this is where myself and other boxers from all over Europe would be stepping into the ring to represent our countries, in the hope of becoming a European champion. England had selected 7 of us to compete, and none of us could wait for the tournament to get under way, this is what we had been training so hard for over the months – the commute to Sheffield week in, week out, the grueling training sessions, the sacrifices made just to get to be in this position – this is what it all came down to. 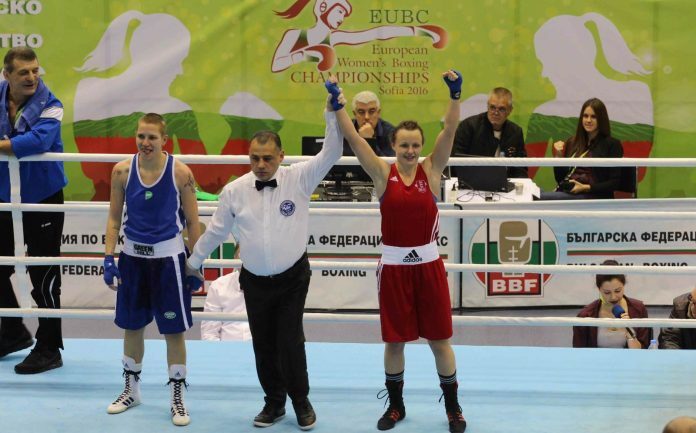 The European Boxing Championships was the first major tournament for women held after this year’s Olympics, and for me it was my first major international. This would be my England debut, so to say I was nervous would be an understatement as so many things go through your mind – will you perform to your best, what if you don’t medal, what if you get knocked out of the competition the first day – it feels like there is so much pressure and you just want to do your best, not let anyone down and prove that this is the stage that you belong on – but at the same time I was filled with so much excitement and I couldn’t wait to lap up the entire experience of boxing abroad, against the best boxers that Europe had to offer and to hopefully make an impression. The whole experience was very intense, it was obviously physically hard but the mental aspect was tougher. We all went through highs and lows but had a great team to support us, we had each other, the coaches, a physiotherapist, nutritionist, performance analyst and psychologist. So no matter what was wrong, whether it be an injury niggle or a struggle with our weight or even just to talk to someone, it was covered. The coaches were made up of both England and GB, they made sure every one of us knew what was happening each day of the competition – who was boxing that day, team meetings, when we were going for food etc. Our accommodation was in a hotel just 2 minutes walk from the venue, this is where not only we stayed but also where all the other participating countries would be staying too. So walking anywhere in the hotel you would be met with fierce glares from potential rivals sizing you up, trying to figure out if you could be a danger to them in the coming week. But within a short time of the competition starting, the majority of these glares turned to friendly smiles of solidarity between the boxers of all nations – we were all experiencing the same nerves and emotions. The general weigh in on the 15th marked the start of the tournament. We had two of our girls boxing this day, while the rest of us would be destined to box over the next few days. As a team we religiously went and supported each other, cheering our boxers on as they entered the ring and making sure to drown out the opposing teams, by shouting out as much motivation and help as we could from outside the ring. The days went by slowly as I was nervously awaiting my debut on the European scene. 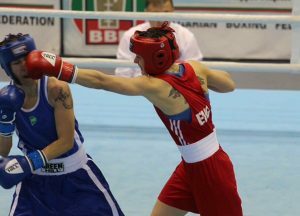 I would have been in Bulgaria for nearly a week until it was my go to give it a shot in the ring – I can’t say whether I preferred it this way, or if I would rather have boxed sooner. I was itching to get in the ring, especially after watching my teammates, as I was hungry to compete. But by waiting you become more accustomed to the surroundings and the procedures of the competition. I remember the sense of nerves I felt, when it was my turn to compete, as I made my way to the ring, the pressure starts to mount, but this was so overpowered by my want to succeed and do well – I have always felt that I thrive off the pressure. 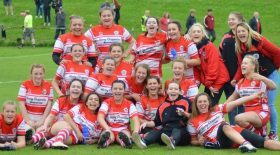 I knew I had family, friends and my club coaches’ support from back home, whether in their thoughts or if they were watching. I was picturing my coaches prep talks. Going over their words of advice and guidance in my head. It gives me that sense of calmness before going in there, it’s the calm before the storm, switching myself on, psyching myself up. I experienced a massive high from winning my debut for England. It felt like a massive achievement, to win a bout representing your country in such a big tournament is stuff dreams are made of, although I couldn’t revel in it for long. I boxed in the quarterfinals, where I lost out on the decision, in a bout that I felt I had boxed well scoring with a lot of clean shots but sadly for me, it wasn’t meant to be that day. The feeling of heartache is so immense, although everyone around you are proud of you, you can’t help but feel disappointed like you’ve let them down, you know you had the capability of getting further but just couldn’t reach it. That’s the thing with sport, it can’t always be highs. And boxing is one of the toughest sports to take part in and when there’s lows it is truly the worst feeling in the world, but it’s how you recover from the lows and learn from your experiences that make all the difference between making it to the top. As a team we came away with 3 medals – 2 bronze and 1 gold – and everyone was a part of each other’s journey living through their highest points to their worst but each one of us came away feeling stronger and more motivated and more eager to succeed.